Flowering hedges add beautiful color to the landscape as well as provide privacy, windbreaks, and habitats for birds. Formal and informal gardens benefit from flowering hedges with spring and summer blooms and also with fall and winter foliage. Choose several types of hedges to use for different functions--tall, for areas where a tree may be too confined; medium, to draw the eye from trees to flower beds; or small, to designate areas and mark boundaries. Rose of Sharon (Hybiscus syriacus), also known as shrub althaea, is a deciduous, upright, bushy shrub. It grows up to 20 feet tall with a spread of 10 feet but usually tops out around 10 feet. Its green leaves are 3 inches long and deeply lobed, and its blooms are 4-inch wide, open bell-shaped flowers of pink, rose, white, lavender or blue. Rose of Sharon blooms from summer to autumn. Grow in full sun or very light shade on nutrient-rich, well-drained soil. Rose of Sharon is hardy in USDA hardiness zones 5 through 10. Hydrangea (Hydrangea macrophylla) is a deciduous shrub with a rounded, compact form, growing 8 feet tall with a spread of 3 to 5 feet. Hydrangeas have thick, 9-inch leaves and large clusters of flowers called cymes. Hydrangea flowers are very showy and soil conditions determine their color: blue flowers grow in acid soil, pink flowers grow in alkaline soil, and white flowers grow in neutral soil. Grow hydrangeas in partial to fairly deep shade and in nutrient-rich, moisture-retentive soil. Hydrangea macrophylla is hardy to USDA hardiness zone 5. Sweet viburnum (Viburnum odoratissimum), is a large evergreen shrub that grows up to 20 feet tall but is usually seen much smaller. Sweet viburnum has elliptical, 6-inch long, leathery leaves and showy, white, 4-inch long panicles (elongated and stalked inflorescence) of extremely fragrant flowers. Grow sweet viburnum in full sun to partial shade in various soils. Sweet viburnum is hardy to USDA hardiness zone 8b. Formosa azalea (Rhododendron simsii), also known as Indian azalea, is a densely foliated, somewhat spreading shrub growing to 10 feet tall. Its leaves are 3 inches long and dark green. Formosa azalea has 2-inch long, funnel-shaped flowers, ranging in color from white, pink, lavender, rose or red, that bloom in clusters of two to six flowers in late spring. 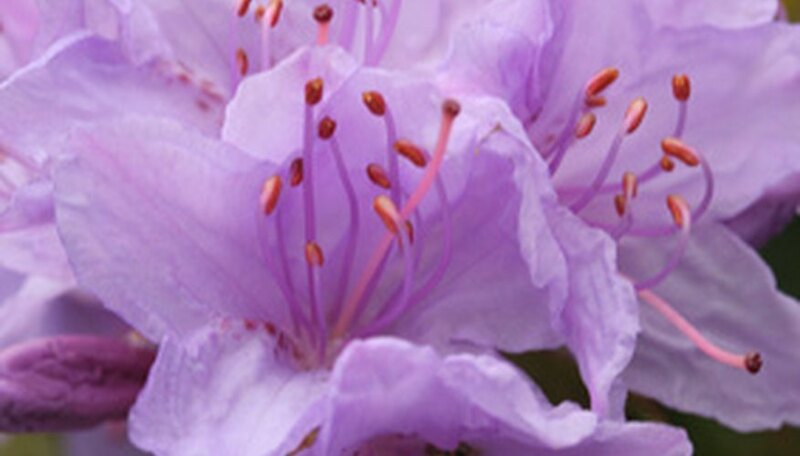 Grow formosa azaleas in partial shade in nutrient-rich, well-drained, acidic soils. Formosa azalea is hardy to USDA hardiness zone 7.